A wonderful beach on the wild stretch of coast between Pendeen Lighthouse and Morvah. The walk down means it’s less crowded and a favourite with the locals. There are no amenities so we recommend taking a picnic. Park at Pendeen Lighthouse, or turn off just before the village of Morvah to use the field carpark. Both ways involve about a 25 minute walk. Portheras is always a surprise, the North Atlantic storms can totally re-landscape this beach, and its always thrilling to witness the seas or the transformation that takes place afterwards. Though the sea can occassionally be too wild for swimming, it's never for the seals, and there is always the stream that is fantastic for young children; damming the stream is a constant favourite and usually ends up with everyone being involved - adults included! It's a great place to be for a romantic and magical sun set over the sea. No lifeguard. Very strong currents. Can be very rough. Long walk but otherwise fantastic! No need to use a car to reach Portheras beach if you are staying locally and enjoy walking on the South West coastal path! 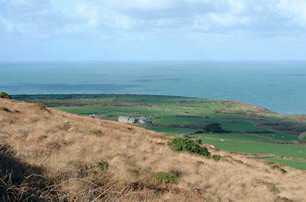 It can be reached within 3/4hr by using public field paths from Morvah and Trevhowhan that link with the coastal path. You have to walk a little to get to this beach but you won't mind, the scenery is stunning. 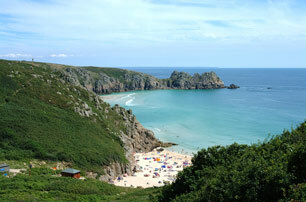 Once you get there you'll find an idyllic sandy cove, that doesn't fill up with people - even in the height of Summer. Swimming is great here, although some metal remains under the sand from a shipwreck and can sometimes appear on the beach. You just have to use a bit of common sense to avoid it but I wouldn't recommend this one for young children.